IoT is very well-known throughout the corporate world. For starters, this isn’t another IoT article where we’re going to do home automation. This is a simple walk-through about adding a server-less back-end to your existing IoT system. We’ll touch on how Azure IoT Hub will be used as an event hub or a messaging system for “Things.” Also, we’ll cover how these incoming messages can be routed to the related database using Azure functions. No devices will be used. We’ll be simulating our PC as a device and use node.js to connect to IoT hub and stream data. Then, we’ll see how the streamed data to the IoT hub can be routed to the DB after some logic. 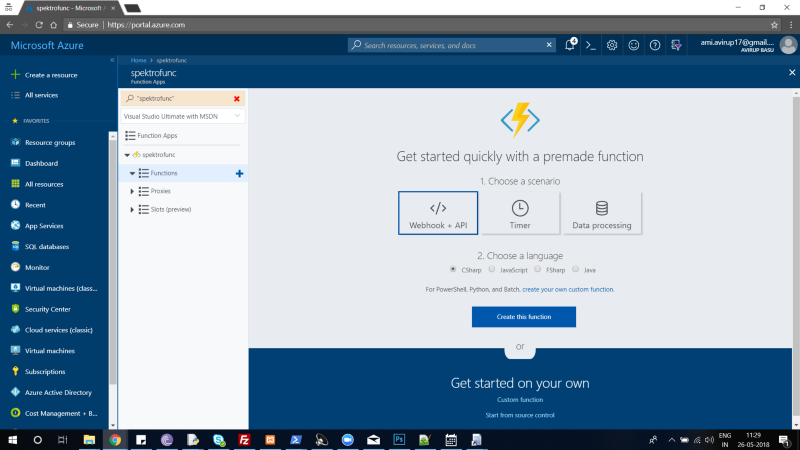 Doing so, by using Azure functions and C#. Finally, we’ll see how the integration happens where we connect every component to everything. The above figure shows the basic architecture or flow of the system. It also should be noted that we’ll be using cosmos DB’s mongo DB API to access the database. This displays the flow of data from a device to the database using an architecture without a server. 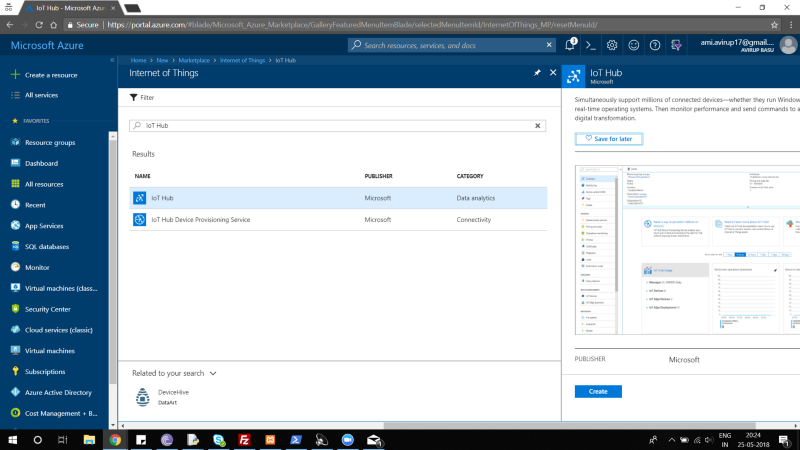 Azure IoT hub is essentially an IoT platform. Using this, we are going to send messages from our simulated device. Technically, the device section of any IoT system is referred to as an edge device. 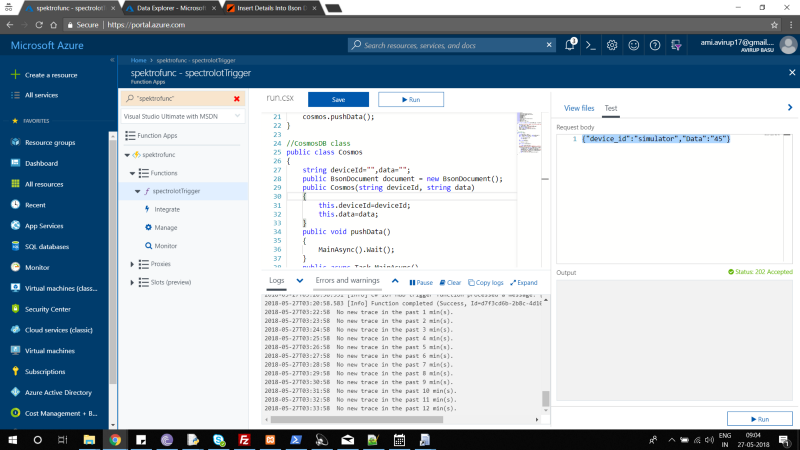 From our simulated edge device, we are going to send data to the azure IoT hub using MQTT protocol. 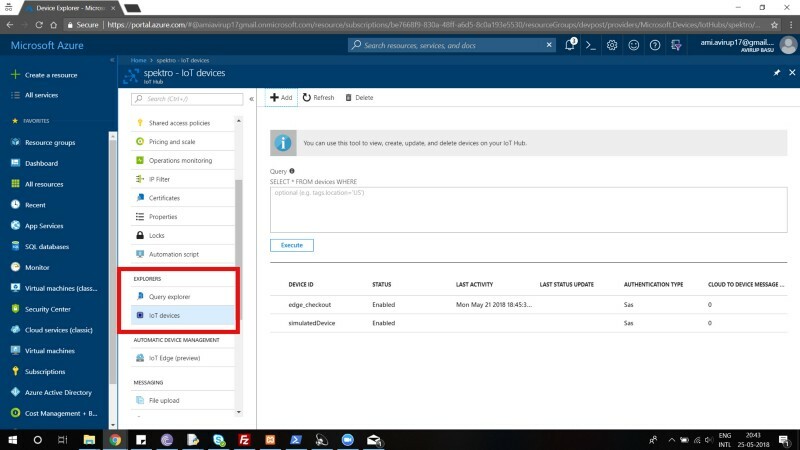 First, let’s go over how to set the Azure IoT Hub. Head on to https://portal.azure.com and create a new IoT hub. Once created, we will add a new device and name it something relevant. In this case, the name of the IoT hub is “spektro” and the name of the device is “simulatedDevice”. To create a device, click on the IoT hub you just created and head on to the “IoT devices”, under the tab “Explorers”. After creating the device, the next step is to write a code that will simulate the device and send some exciting raw data. For the code, we will stick to node.js. Use the npm package manager for installing the module. After a successful installation, we can use the above dependency. Another important parameter we need to note is the connection string. This will act as a key for our simulated device. For this, click on the device ID you just created. In this case, it was “simulatedDevice”. Once you click that, you will end up in device details. From this page, you need to copy the “Connection string — primary key”. This will allow the device to communicate. Then it can be copied and pasted. As mentioned earlier, the dependency needs to be installed. Here we’ll see how the dependency is used to stream data. Our data, in this case, will be a JSON string containing the following parameters. “Device id” is the one that’s created and “Data” just values varying between 1 to 100. In the code above, we have used the function azcall() for streaming the messages after every 1.5 seconds. 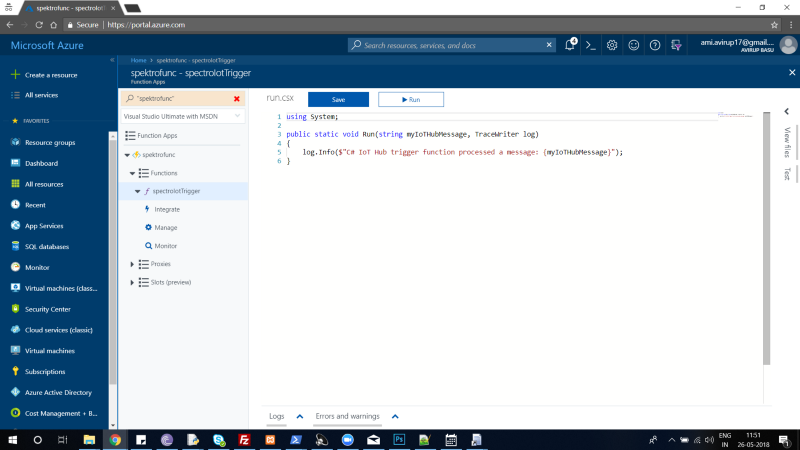 It’s a simple implementation of the azure IoT hub SDK which uses MQTT protocol internally. 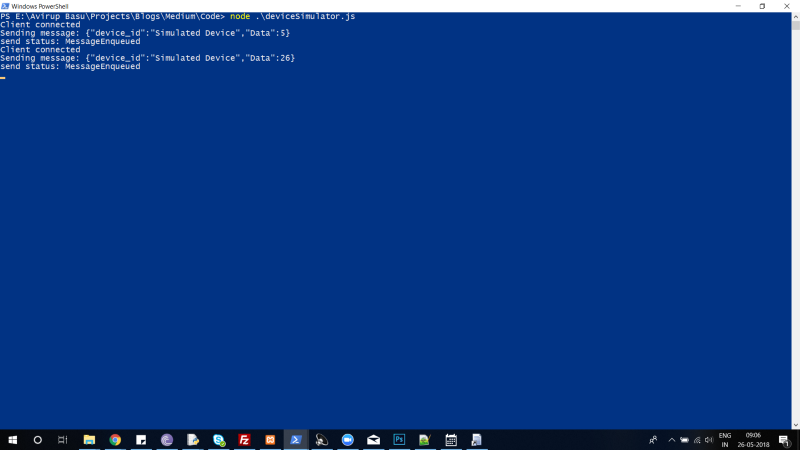 In the function pubData(), we’re publishing the data to the Azure IoT hub which is a JSON string. The code is based on the sample provided by the Microsoft team. Before executing the code, we have one small step involved. We must check out the incoming messages to the Azure IoT Hub. 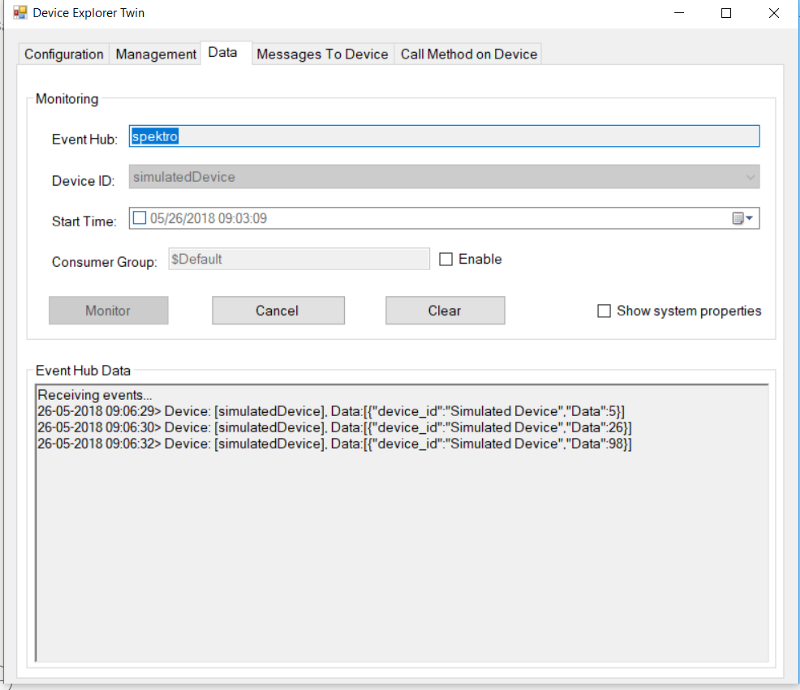 There’s a utility by Microsoft known as Device explorer twin. That allows us to monitor the messages. It’s a Windows C# app and can be downloaded from the below Github link. In order to use this, we need the connection string of the IoT Hub, not the Device. 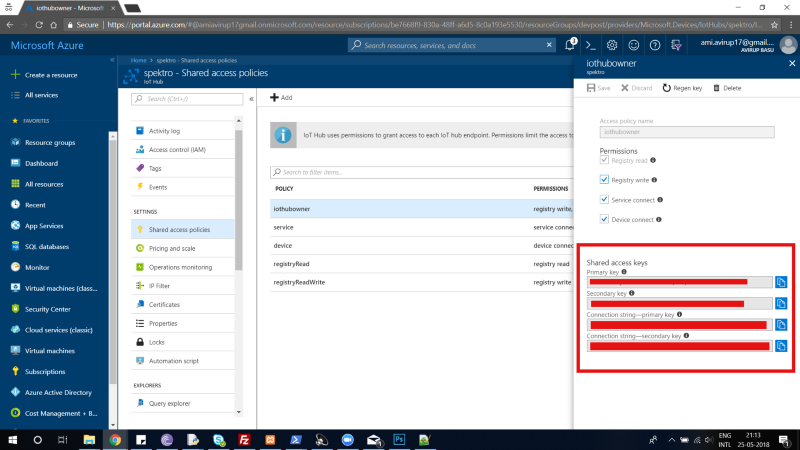 So head back to the Azure portal, and click on Shared access policies. Fig 6: Shared access policies. Click on shared access policies to open the policies panel. Here we are interested in “iothubowner”. Click on it to open the policy details. Copy the “Connection string — primary key”. 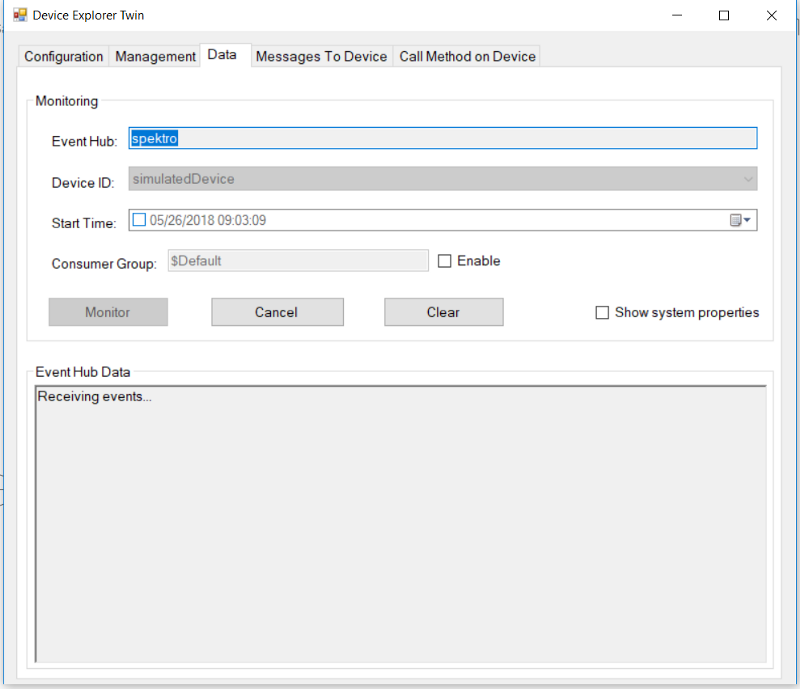 Now, fire up your device explorer tool and paste the connection string in the IoT Hub Connection string input panel. Then, click on update. After the update is successfully finished, click on Data. In this section, the device that you created from the portal before should appear on the Device ID drop-down. Select your device and click on the monitor. Now, head back to the folder, where your node.js code was written and execute the code using any IDE. Or in this case, we used Windows Powershell. 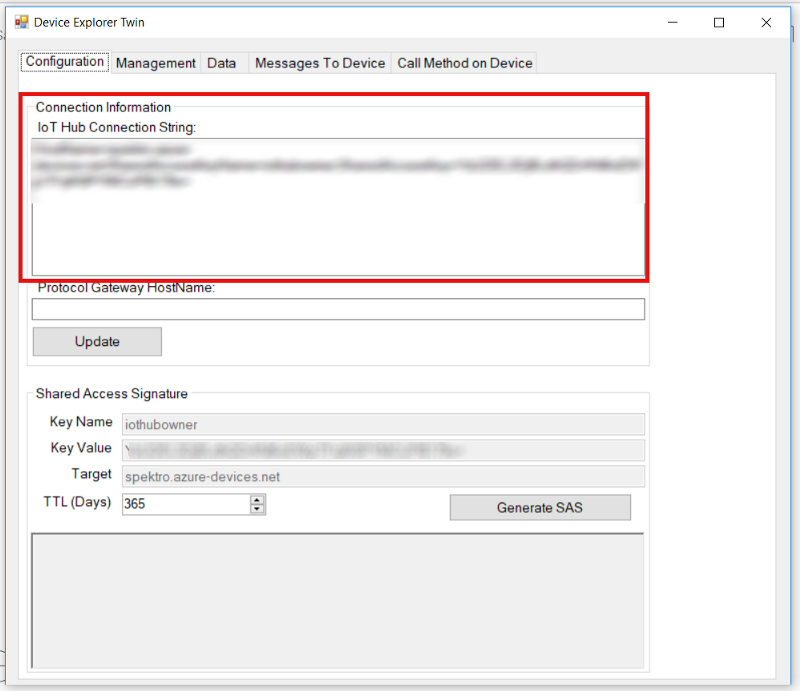 At the same time, maximize the device explorer tool and then we’ll see the incoming messages as shown. Fig 11. If everything is done correctly, the messages should appear here, which means that messages are being received by the IoT Hub. Now that we can send messages to the IoT Hub, we can write a server-less API for routing these messages to the Cosmos DB using Mongo DB API. Initially, we’ll set up the cosmos DB such that we know where exactly we need to route the data. Click below for a detailed description of Cosmos DB. Understood correctly, it’s a very informative write-up! Create a Cosmos DB from the Azure portal as a new resource and select MongoDB under API drop-down. After your deployment is completed, head on to the DB you created. In our case for reference, the name of the DB is “spektrodb”. This Cosmos DB is based on documents and it’s unstructured DB. Therefore, we can create new documents on the run-time. We just need to create a database for now under the name of “database_spektro”. Fig 13: MongoDB database create. For now, we’ll leave it in this way and just copy the connection string as it will be required in our Azure function. Head on to the DB you just created and click on quickstart. Keep the above data primarily to the connection string under .NET section somewhere saved locally. 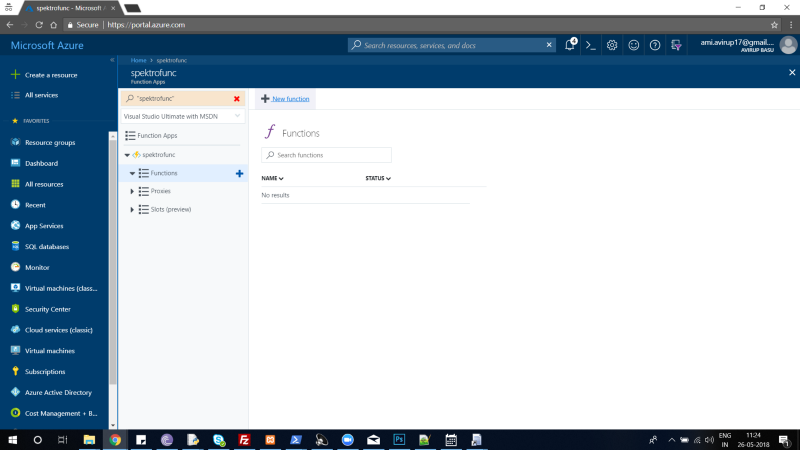 You may also want to have a look at the code as it’s going to be used in the Azure functions. It’s like a micro-service that gets going whenever there is any triggers or requests. Here, we are interested to trigger an azure function whenever there is an incoming message in the Azure IoT Hub. Before that, let’s create an azure function first. Head towards the Azure portal and search for azure function. In this case, the name of the function is “spektrofunc”. Click on a new function. Next, click on the custom function and navigate to “IoT Hub (Event Hub)”. After that, a configuration window will open where we will configure our IoT Hub named “spektro”. You can name your function anything. We named it as “spectroIotTrigger”. Under the event hub connection, click on new. Here, click on IoT hub and the name of the IoT hub should appear. Click on select and finally on create. Now, your function is ready for you to write code in C#. Before writing the code, let’s find out how the already provided sample will work. In order to test the sample code provided, we need to click on test and logs, which is a place where the messages or errors are displayed. Click on run and the test message should be displayed. We can also test with our device simulator in node.js. Just execute the code in the back-end, and the messages will be shown in the log window. Now, we can see the incoming messages in the azure function. The next task is to handle these incoming messages which will be used to publish data to cosmos DB. Before jumping off to integrate cosmos, we must include the dependencies. Adding dependencies in azure functions is a bit tricky. Click on “View files” just above the “Test” button. Then, we need to add one file named “Project.json”. In the file, we need to manually declare the dependencies. For cosmos DB with MongoDB API, we need MongoDB driver. For handling JSON, we need Newtonsoft.json. You can also declare the .net version. Let’s declare them using the following JSON. Now, click on save and then browse to run.csx file. Include all the necessary “using statements”. Now, save it and run the file. If there isn’t any compilation error, then dependencies have been successfully installed. Let’s write the code for decoding and pushing data. Our target is to create a new document named after the device ID. Then the document will contain the required parameter ID and parameter values. The code above is the azure function written in C#. It decodes the JSON received in the string message from the azure IoT hub. A class was created to handle the MongoDB message push. We pass the parameters through a parameter constructor and by an async call. 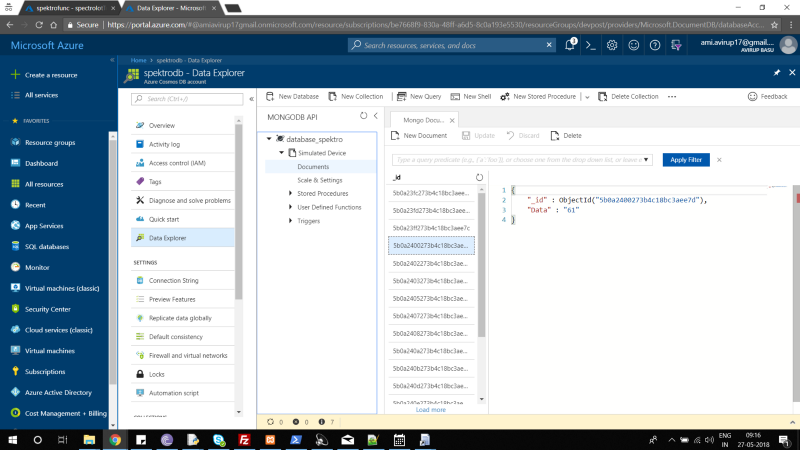 Then, we push the data to the CosmosDB using MongoDB API. There are two options for testing the code. You can create any name for the DB. Recall the “Test” area where there was some sample message. In the test area, you can replace it with a JSON and click on run. This should execute the code with the sample input. Run a test for any errors. Now, let’s check this with the simulated device code we have written earlier in node.js. Head on to the local folder and start the node.js code. Once it starts executing, go to your CosmosDB and click on “Data Explorer”. Click on the database that was created and then on the table name which is basically the device ID. Our device ID was a simulated device as in the node.js code. After we click on documents, the JSON files appear. Click on anyone and you can check out the data. We have seen how we can simulate an IoT device using node.js and send messages to the IoT hub. Finally, we route the messages into respective tables in CosmosDB based on the device ID and stream data. This has a lot of use case(s). Let’s take an example of telematics data from a car or any machine to be sent to the DB after a certain time interval. From some kind of remote weather station or any IoT use cases where data is involved. Now that you know the flow of data, why not comment some use case(s) which perfectly fits in this flow? 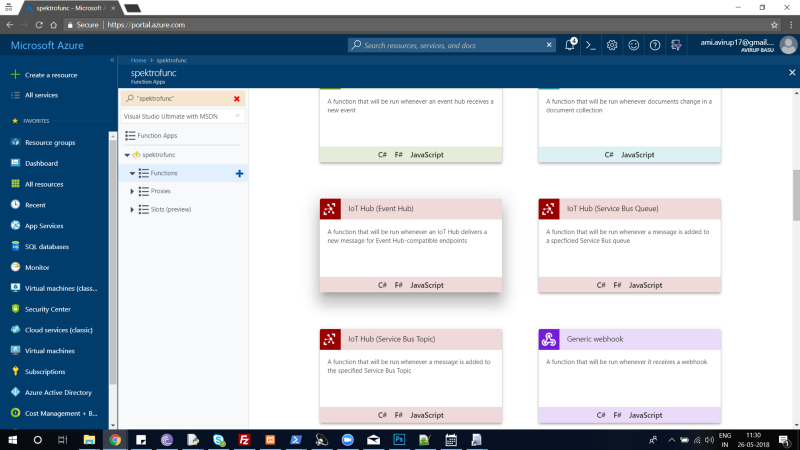 The part that we didn’t cover is the use of rule engines which can be programmed in the azure function. Another topic for another article! Curious about how Azure can impact your business? Get in touch with us today for a free consultation on how the various Azure platforms can help you grow your business. If you have any questions about this article or face any difficulties, drop a comment below!